Today, I'm giving a shout out for my wonderful new friend, Barbara Lewis, from Jewelry of Distinction. 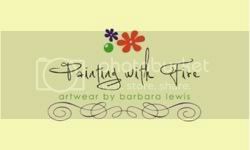 She has recently relocated and her beautiful new blog is called Painting with Fire, Artwear by Barbara Lewis. Did I say GIVEAWAY? Oh yeah. Barbara is having a drawing for a little bouquet of her gorgeously inspiring torch-fired beads. I'll take anything Babs would like to send my way - be it headpins, beads, inspiration, good looks, whatever. The lady's got taste. Hop over to her new site and say hello. I guarantee you won't regret.